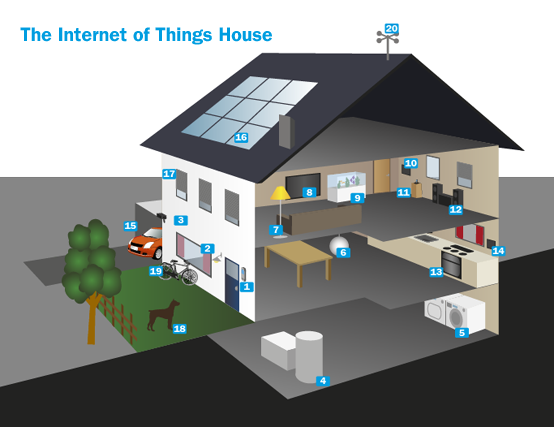 Internet of things and smart home – What It Is? 50 billion connected devices… What is also known as “internet of things” will be a new revolution in our lives. In addition, do not think that there is much for it. Experts say that we will reach that number of connected devices forming their own internet in 2020. Everything that can be connected to each other will be, with the good intention that the devices can make their own decisions. No, you do not worry; we are not talking about Skynet or dystopian universes. We are talking about the possibility that the Internet of things to improve our quality of life, save energy, and make us life easier, even in our own home. In this article, let’s spend a couple of tickets to see what the internet of things and how it can revolutionize our nearest future. In the first paragraph already, you suggested some of the reasons that will make the Internet a reality thing. Any of you and your houses shall count with regulators programmable heating or air conditioning equipment. In this case, you would gain intelligence, being that you decide when to turn on and turn off the devices and what will be the ideal temperature. I have noticed that this is not as efficient as if we are not at home since conditions may vary and the program follows “fixed gear” regardless of what happens. An example might be an irrigation system, which we program for acting at a certain time each day. However, if it rains we will be wasting water. The first reason for being so smart and interconnected devices a gap in the home will be energy savings are made. In recent years, there has been a fairly significant increase in energy costs, with a strong impact on the pockets of the consumer. Therefore worth thinking about devices that, although resulting somewhat more expensive, can compensate in the medium and long term overpricing them. In addition, I do not mean electro domestics class A, but items in the home that can make decisions combined between them. An example might be a weather station at home indicating the temperature and conditions to the air-conditioning units and the electric blind, so that is closed if it is very hot and if we are not home. This will reduce power consumption. Does it cost a lot to make a “dumb” device become intelligent? Much less than you imagine, at least as far as hardware is concerned. In addition, it is that a Raspberry Pi, a card with a processor ARM and basic 256MB memory, costs about 25 dollars for the end user without Wi-Fi, something more if we wireless. Moreover, we are talking about a card with a fairly high processing power (that is capable of playing video at 1080p). We also have plates Arduino and with evolutions of it, quite interesting and that allow direct control of other elements. As you can see integrate intelligence on any device it has a very low cost to any device manufacturer. The second reason, and probably the most important to have a connected home is a comfort. The same electric blind we mentioned earlier could rise 30 minutes before sounding the alarm, so we wake up with daylight (that if not woke up early a lot), or the bedroom light would go turning slowly if there is no light outside. We went into the shower and get the information of what we do today and how long it will, and when we left the bathroom automatically gets to take our coffee thanks to a WeMO interface to finish wake. When leaving home umbrella lights to remind us that we have to carry. In addition, if we are something the mobile phone will warn us and help us locate where we have put. We were talking before comfort. I think a fundamental factor for the internet of things enters our house is that human interaction is the essential minimum. However, who will take the decisions? Will there be an intelligent element (PC, tablet, or smartphone) to take decisions and rule over all devices, or intelligence will be distributed and devices will make decisions together (as for example the alarm and blind)? Probably a mixture of both, because if it is true that there will be simple actions that involve only two devices, there will be more complex actions or requiring the coordination of a more intelligent element, as we shall see. It is also true those not only have devices that perform certain actions but have elements that detect behaviors, situations or conditions and are able to distribute such information to others. Thus, presence sensors in each room will enable light, heating; air conditioning etc. is disconnected if left not to continue wasting energy. Sound sensors will adapt the volume of the music when the phone rings. Sensors that they notify us via Wi-Fi or activate the watering houseplants. Alternatively, a room sensor will identify which elements are in it. Therefore, we never lose your keys or mobile (or, at least, we will have more tracks where we left). How the devices are connected? The home gives us the possibility that devices connect via Wi-Fi. Probably the most used option because home will not have problems feeding them. Another possibility is the interconnection via Bluetooth. In version 4.0, we gain a better energy, better transfer rates, and scope. To connect them without having to interact with them, NFC earns enough points and guarantees the security of the connection due to the need to bring the devices less than 10 cm for interconnection, much less than Bluetooth (10m, 100m Bluetooth 4.0) or Wi-Fi (50 to 150m). For devices outside the home is committed to communications networks via 3G or LTE. We will see as far as the intelligence of the devices will come, who will make decisions and the interaction of humans with the elements that make up the internet of things at home and interacting with each other such devices. The internet of things is a concept that describes the interaction of devices and elements in a global network. The human being goes into the background, as the real protagonists are the elements that make up the network. Devices that interpret the physical world and the virtual world, change our world, probably making our simplest, and benefits ranging from energy savings or safety of older people telepresence life. I read an article earlier in Forbes, about the internet of things and how it will revolutionize our lives, focusing on those aspects of the smart home. In this article, we will see what aspects will evolve and how will the relationship between devices and humans. The evolution of everything around us continues a little evolution of the previous image. Right now, we are in the first wave, where all the devices around us are connected to each other, increasing their chances. Next will come to the industry and automation. In the third wave, everything is connected and the decisions will be global. We discussed that the devices will be able to communicate with each other and make decisions more or less together, with the least possible human interaction. However, for this to happen, many household items have to be able to describe themselves, even if they are not connected or have batteries. Type clothes label BiDi or bar code indicating the type of fabric washing is water and the amount and temperature required under normal washing conditions. Furniture indicating what their dimensions so that the vacuum can surround them without problems, etc. Who’s the boss at home? Before anyone says that his wife is the boss at home, talking about the devices associated with the Internet of things. We probably have a computer that can monitor the rules and policies of household devices. You will also be able to take certain types of decisions, but we will be those who have the baton at all times. Moreover, through the internet that can modify rules or add new conditions. When to present together to devices, probably the associate to “intelligence of the house” more or less automatically. The computer can thus assume the role of master of ceremonies and see how it fits a new device with everyone else if you need to modify any of the existing rules or add some new. Although it may also be that auto programmed devices without the computer say anything ( an example of the blind and alarm). Also in the case of failure, the devices can call home (like ET) and request a repair, for which they consult our electronic diary and see what time we will be at home to schedule a visiting technician at that time. In short, the devices have to describe what services they can perform, what events can subscribe, which events can generate, and what chain of actions can participate. In addition, all transparent to the user, although it would be nice to have the chance to tinker and modify things to more advanced users. How come humans in all this? Although at first may seem a contradiction, the less between human beings and less involved, the more successful acceptance at the home of the internet of things. Are worthless lengthy instruction manuals or having to program the devices? The human being, through laziness or lack of time or combination of both, is the least read instruction manuals. In addition, so far is the only one qualified to do so? Services like IFTTT in which events, actions, and tasks are defined will be those who “cut the cord”. The less we intervene, the better. If the coffee machine knows when to make coffee in the morning, the bread that we buy will present their services at home, and will automatically point to the event “breakfast” for the preparation of bread ‘and that everything is ready when of breakfast. This will appear on the screen of the tablet or why not on the screen of the refrigerator, just in case only ate breakfast toast weekends and arrange to target the ingredients of flour and yeast recommended by the bakery in the shopping list to have enough supplies. In short, we will be notified of what you can do and what needs you have and if you have to interact with the element, such as to load the ingredients, we can receive a notice on our mobile to do the night before. Will facebook devices? Will they be a score I like / I do not like? It is not unreasonable to think in a “Facebook for devices “. No, they will not have holidays or send each other photo. However, they can sign up, make friends, present your services (and here it can make the services supported each other, which would amount to a “like”) and ultimately establish their circle of friends. A device could be a friend of several homes or locations, such as laptop carry from home to work and back home, so probably the association not for “home or location” but the devices probably have their unique identity and nontransferable. We can protect these friendships and change or modify the links between devices, or “like / dislike”. Something like children and supervise their relationships. This model is the least effort required on our part and which may prove more beneficial in the long term. If manufacturers also leave the doors open via APIs or development kits, the possibilities grow exponentially. As you can see, the internet of things really opens up a world of amazing possibilities in smart homes and we probably short in terms Let’s meet our expectations. After all, neither the internet we both human and you know how it has changed our lives at all.